The Discovering Harbourside event, which took place on June 9, was so popular that it had sold out even before I had written about it. Luckily the time travelling walk was given a second date, hosted by Stanfords in Bristol, and this took place on Tuesday June 22. The talk and walk was based on the book ‘Discovering Harbourside: A Journey to the Heart of Bristol’ which was published in January 2010 and is now available for purchase from the book store on Corn St. The author James Russell and photographer Stephen Morris led a walk around the Bristol docks followed by wine and a book signing at the bookshop. A group of about 20 people set off from Corn St and walked a little way to the first location of the Corn Exchange. Not quite on the harbourside but a focal point for the merchants who would bring their goods and trade them. The three hands on the clock were pointed out, and for those who didn’t know, the two minute hands tell Bristol and London time respectively. The next stop was the Bristol Bridge with a passing comment for the obelisk on the other side of the road. It leads to cellars underneath the old city which are similar in style to the ones at Averys the wine merchants. The rebuilt St Nicholas Church was given some prominence as it now stands over the crypt where John Cabot used to pray. King St and Queen Square were next as the tour walked through the Welsh Back. King St was intended as an ordered and tidy looking street with all buildings ordered built the same as each other and with parallel pavements. For those who have been to King St you will know that none of these plans worked out. The orders were meant to give Bristol a polished look more akin to London but “aristocratic London did not work in dirty trading Bristol”. Merchants built as they wanted and would not be told what to do. Past the reconstructed marsh land of Queen Square, which was built up two metres from its original altitude, we failed to have a closer look at the statue in the middle, due to the Fan Park. Instead the next location was the Princes Wharf and the next story was a quite horrific one of what could have been. In 1974, the harbour stopped being used as such and almost immediately became a heritage site. 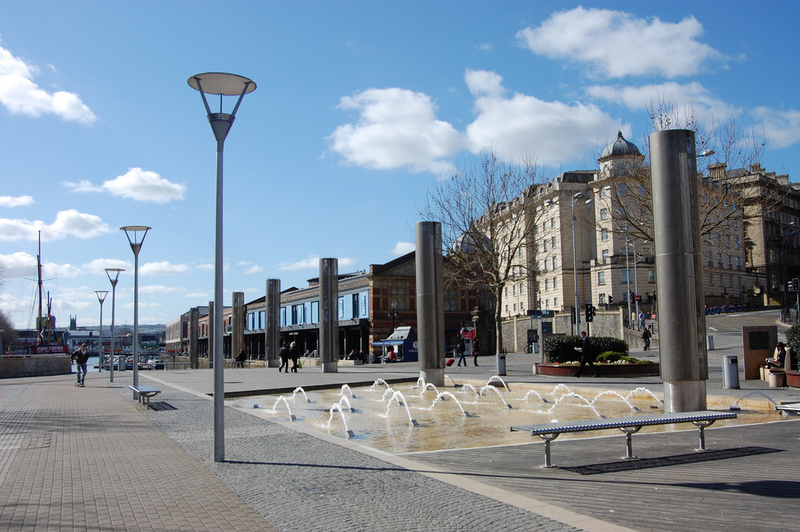 A planning committee was set up and one of the proposals was to get rid of the water in order to build a road through the centre of Bristol and up to, and then under, Clifton. A benefit would have been the reduction in millions of pounds of maintenance which is currently used for the harbour. However, Bush house, which currently houses the Arnolfini would have been destroyed as would over 100 other buildings. Due to popular opposition this plan, thankfully, never went ahead. One aspect not considered was that between the time the water was taken out of the harbour and concrete poured in, the quay side would have collapsed as the water now holds the buildings and sides in place. The last fascinating tidbit that I’ll pass on is about Pero’s Bridge and Bristol’s link to the slave trade. Pero’s Bridge is named after John Pinney’s slave Pero. John Pinney inherited a sugar plantation, in 1760 when he was 30. He moved to the Caribbean island Nevis where at some point he paid £110 for Pero, Pero’s sister and mother, and a woman named Hannah. When John Pinney was ready to come back to England he offered Pero his freedom if he wanted to stay on Nevis or to come back to Bristol and take care of his house for him. Pero chose the latter but apparently was not brilliant at it. The hour spent wandering around the harbourside was entertaining and fascinating in equal measures. Sharing some of the stories hopefully provides a flavour of the history surrounding Bristol and shared with all through Russell and Morris’s book. ‘Discovering Harbourside’ is meant to be more a guide book for time-travellers than a conventional history. Starting with a re-enactment of John Cabot’s return to Bristol from Newfoundland in 1497, it brings Bristol’s port to life in new and entertaining ways, encouraging readers to look at the city around them and imagine moments, scenes and characters from the city’s past. The walk started and finished at Stanfords and lasted just over an hour. This entry was posted in Bristol and tagged Bristol, Bristol Bridge, Discovering Harbourside, John Cabot, Pero's Bridge, Stanfords. Bookmark the permalink.